Check out our promotional video of our farm and facilities professionally done by Red Bird Media! Welcome to Sprucehaven Farm one of Southwestern Ontario's finest educational training and boarding facilities. -We offer a quality boarding facility with a friendly, professional environment and topnotch horse care for your peace of mind. As a multi discipline facility, we offer training and lessons in dressage, show jumping, eventing and western dressage. We also offer international and national clinicians on a regular basis and throughout the year. 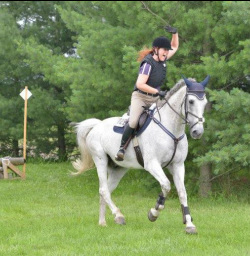 Sprucehaven is one of the top educational facilities in the area, covering not only riding but unmounted sessions such as horse care, stress free trailer loading clinics, rider mental training, and many other horse related topics. Also Sprucehaven Farm is home of Sprucewares, Linda Plank's custom horse ware and Blanket Cleaning and Repairs. Contact Linda for all your needs. We are located just minutes off of the 401, south of Ingersoll. Only 20 minutes east of London, 15 min west of Woodstock. 1 1/2 hours from Toronto ON and 3 hours from Windsor ON. Visit our Schedule of Events page for our exciting Activities! ​2018 Southern Ontario Combined Training Association(SOCTA) show dates COMING SOON! !